Complete pet-food with chicken and rice for large-breed adult dogs. Large-breed adult dogs, in adulthood, after the age of 2, weigh more than 25 kg. Select Adult Large Breeds with chicken and rice is designed to satisfy the needs of your dog and foster optimum physical and health conditions. We use only fresh ingredients provided by local suppliers. High content of chicken meat (37%), a source of essential amino acids and easily digestible proteins. 37% chicken as the main ingredient. Provides vitality that aids a strong musculature and proper development. The potent Lycoproject complex (made with natural antioxidants: tomato, pepper and garlic), along with citric extracts, strengthen the immune system. The essential fatty acids Omega 3 and 6 favour a healthy coat and skin, providing a shiny, strong and well-kept coat. Thanks to the MOS prebiotics that hinder the proliferation of harmful bacteria that attack the intestines, thus favouring the growth of beneficial bacteria and contributing to improved health for the dogs. With Glucosamine to care for and protect joints, with the aim of maintaining full functionality and health for the maximum time possible. 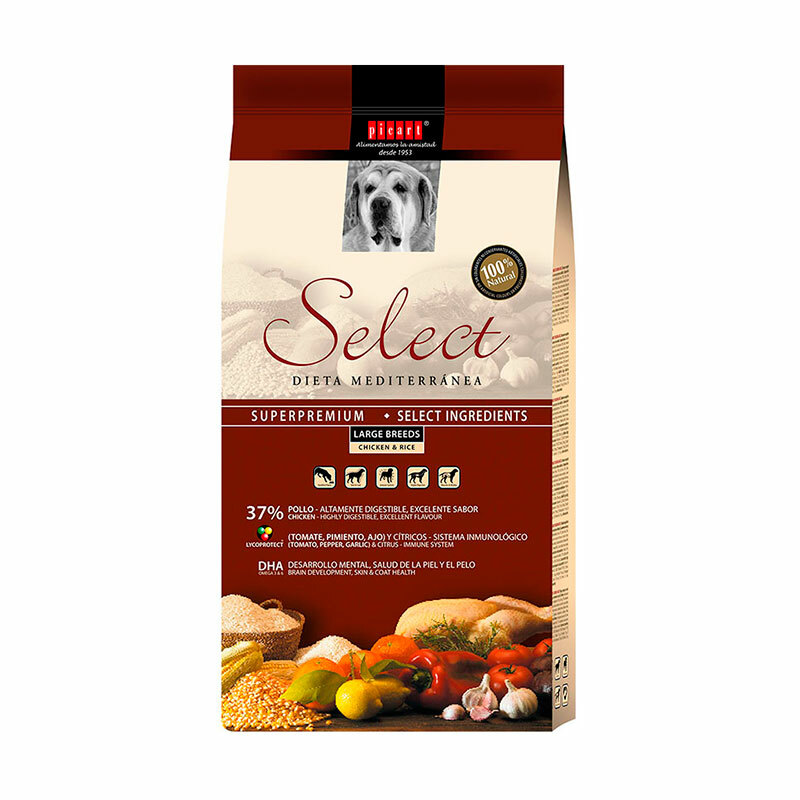 Select Large Breeds comes with a larger sized croquette for proper chewing and ingestion for large-breed adult dogs. Very tasty. Chicken as the main ingredient. Wheat gluten free. 26% Rice. Healthy coat and skin. Fatty acids Omega 3 and 6. Dehydrated chicken meat (min.37%), Rice (min.26%), Animal fats, Hydrolysed animal protein, Corn gluten, Brewer’s yeast, Corn, Beet pulp, Tomato pulp, Minerals, Fish oil, Dicalcium phosphate, Pepper, Prebiotics MOS, Citrus extract, Yucca extract, Garlic. Protein: 26%, Fat content: 15%, Crude ash: 7.7%, Crude fibre: 2.2%. Since its founding, Piensos Picart S.A. has continued to develop and expand, standing at the forefront of the national market with presence in several European and Mediterranean countries. We have manufactured animal feeds since 1953. - Our commitment to quality standards is comprehensive. Our products are designed by vets and manufactured from ingredients of the highest standard, hand-priced with the health of our dogs and cats in mind. - Our aim is the animals’ wellbeing. - Our reward, their affection and company. Albania, Algeria, the Balearic Islands, the Canary Islands, Cyprus, Egypt, Estonia, France, Georgia, Germany, Greece, Israel, Italia, Lithuania, Malaysia, Malta, Moldavia, Morocco, Poland, Portugal, Rumania, Slovakia, Slovenia and Spain.